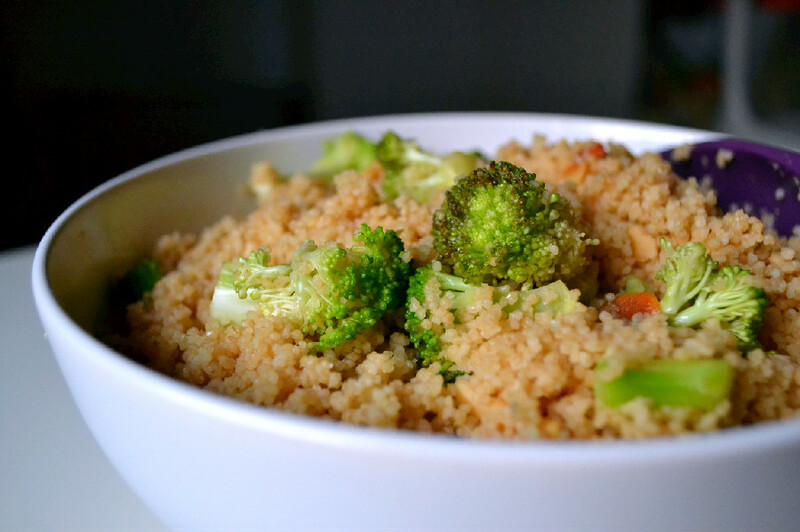 It may seem like a trivial task, but the first few times I made couscous, it wasn’t pretty. It came out mushy and clumpy and a real mess. Trial and error and some tips from Chef Arianna at La Sana Gola, and I learned that the trick is in adding the the olive oil and salt before the water. Here’s what you’ll need for the perfect fluffy couscous every time. Shallow square or rectangular glass or ceramic dish. Sprinkle with sea salt (and herbs if using) and drizzle with olive oil. Mix to coat the grains with the olive oil. Bring 1 1/4 cups of water or broth to a boil. Pour 1 cup over the couscous, slowly, until you have covered the couscous completely with water. Cover the dish and let sit for 10 minutes. Uncover and gently rake the couscous with a fork, layer by layer, separating the grains slowly without creating any clumps. 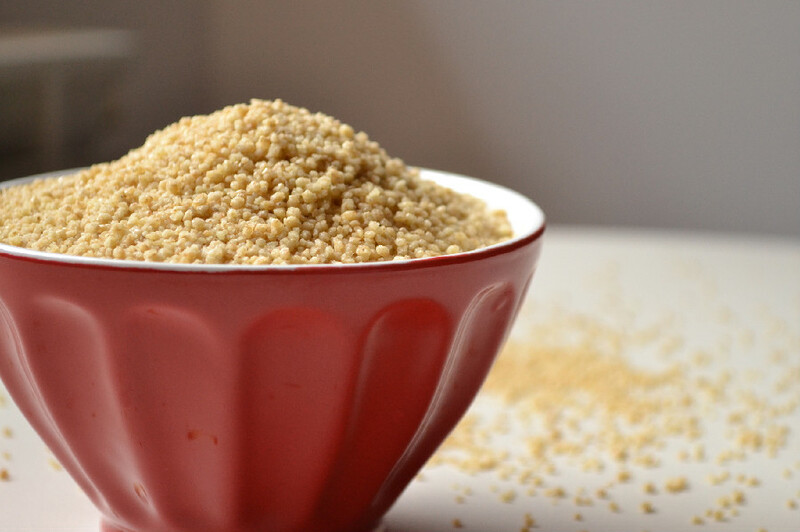 By now you should have perfectly fluffy whole grain couscous. 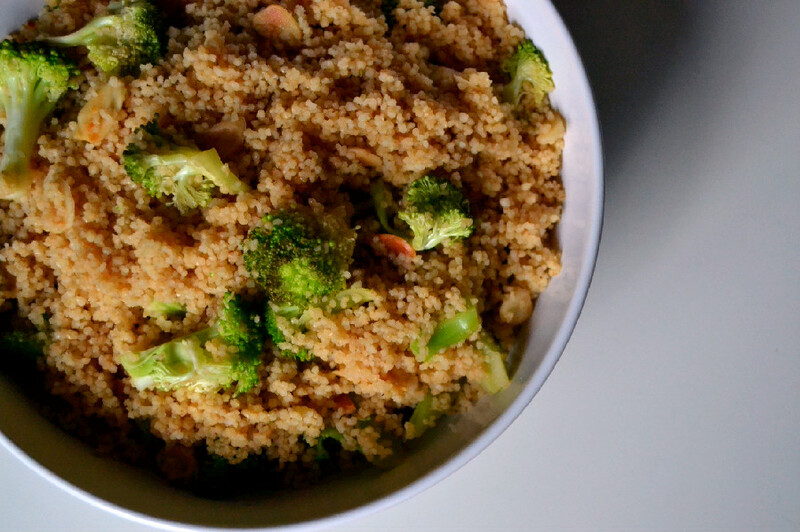 Now that you’ve made that fluffy couscous, here’s a quick and easy way to turn it into a salad. Crunchy broccoli and almonds, fluffy couscous and a sweet soy-mirin dressing make a nice light and healthy main course salad or side dish to accompany any meal. Steam or blanch the broccoli for about 3 minutes. They should be crunchy and just barely cooked. Remove from heat and let cool completely in a colander. Separate any large florets into smaller ones, add them to a large salad bowl and set aside to cool. Dry toast the slivered almonds over medium heat until slightly browned. Let cool, then sprinkle them over the broccoli. Meanwhile, prepare the Sweet Soy-Mirin Dressing. See recipe below. 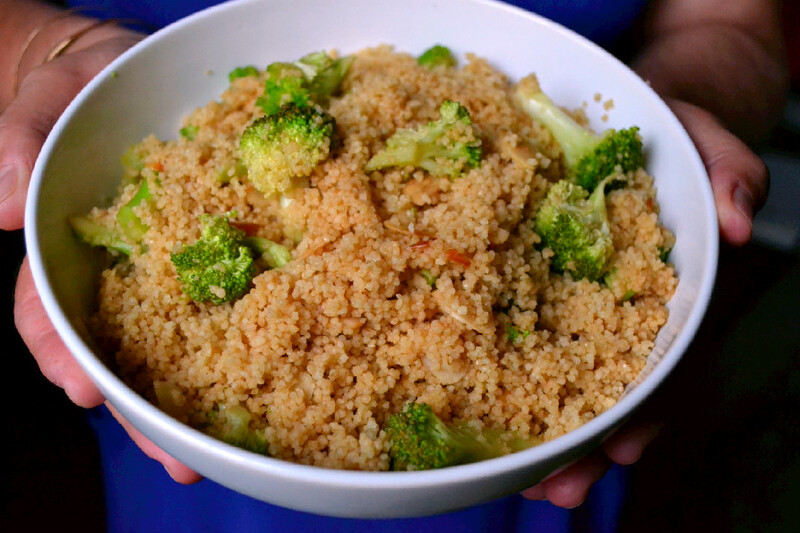 Add pre-cooked couscous and Sweet Soy-Mirin Dressing to the broccoli and almonds and toss to combine. Serve as a main course salad or side dish. Now here’s the recipe for the Sweet Soy-Mirin Dressing which I adapted from Taste Magazine to make it refined sugar-free. Mirin is a sweet Japanese rice wine that is sometimes used in Teriyaki sauce and makes a great addition to salad dressings. Add Mirin and brown rice syrup to a small pot over medium heat and bring to a boil. Reduce and let simmer for 3-4 minutes. 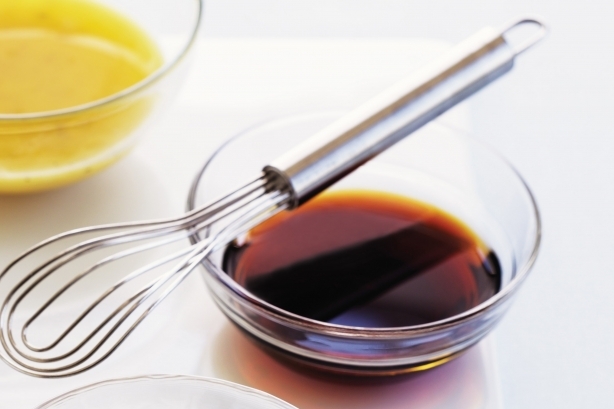 Remove from heat and whisk in sesame oil and soy sauce. Set aside and let cool. Serve over vegetables, grilled tofu, or use as a salad dressing. How do you like your couscous?